The newly installed Bog Walk (2010) follows on from the Green Walk. After leaving the main car park, you will be taken around the Ladies Walled Garden, up past a stand of the marvellous New Zealand tree fern Cyathea dealbata. At the top of the hill there is a path branching to the right, marked with a green way marker. This part of the walk is part of the original gardens and has been restored. It will take you over the top of the waterfall and continue over an existing stone foot bridge. At this point you can view an array of extremely rare filmy ferns, including the New Zealand natives, Prince of Wales Feather fern, Leptopteris superba and the Single Crepe Fern, Leptopteris hymenophylloides. After this, the path will drop down and take you over a number of steps (note the wonderful Kauri Pine, Agathis australis to your left). You have now entered the area primarily devoted to the plants of New Zealand and their islands. As you continue over the raised walk you will see a large number of trunked Dicksonia fibrosa tree ferns interspersed with various NZ native trees such as Agathis, Cordyline, Nothofagus, Phyllocladus, Podocarpus and Pseudopanax under planted with native ground ferns. As this raised walks comes to an end there is a bog walk that takes you over a boggy area of Irish natives, down past a small waterfall and onto the base of the Waterfall area. Here the plants are of Tasmanian origin, including Athrotaxis, Phyllocladus aspleniifolius (Celery-top pine), large mature clumps of Todea barbara, Blechnum watsii, Blechnum nudum and Cyathea australis, amongst others. 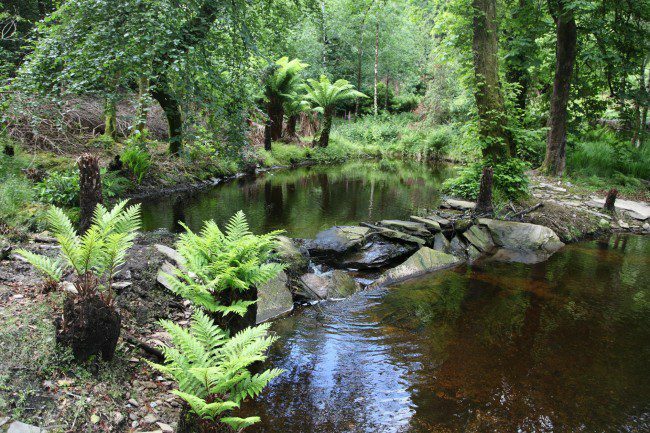 The rest of the walk will take you up the main driveway through the Palm and Succulent Garden and back to the Garden Tea Room, where you can enjoy a cup of tea. Footnote: Please do not walk anywhere near the top of the waterfall.